Yesterday was the 109th anniversary of the first performance of The Eyes of Texas. Written by John Lang Sinclair and Lewis Johnson, the song poked fun at UT President William Prather, who frequently ended his speeches to students with the phrase, “and always remember, the eyes of Texas are upon you.” It was also a two-year project for Johnson, who wanted a song that University of Texas students could call their own. A more complete history of the origins of the Eyes is here. 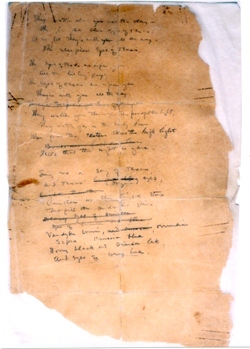 Photo above: The scribbled original version of The Eyes of Texas (not the one sung today) written by Sinclair on a piece of brown laundry paper. It is currently on display in the Alumni Center. This entry was posted in Uncategorized and tagged Eyes, Texas, University by jimnicar. Bookmark the permalink.